Berlin, Germany – The most prominent bank in Germany is at risk of imminent collapse, with potentially profound effects for the EU, the United States and the rest of the world. The prospect of a cataclysmic global banking collapse of this nature has not been seen since the implosion of Lehman Brothers in 2008, and subsequent fallout in the global banking world. But these events haven’t taken place in a vacuum, as earlier this year savvy international investor Lord Jacob Rothschild, during a semi-annual address to RIT Capital Partners, announced that they are reducing stock market and currency exposure and increasing their gold holdings, warning that the world is now in “uncharted waters” and the consequences are “impossible” to predict. “The six months under review have seen central bankers continuing what is surely the greatest experiment in monetary policy in the history of the world. The collapse of Deutsche Bank would most likely begin a cascade of Western banking institutions falling like dominos (which could include Barclays in London and CitiGroup in the U.S.). According to the same expert who valued Lehman’s worth at it’s collapse, Deutsche Bank’s current value of $1 trillion dollars is significantly more than Lehman Brothers’ valuation during their collapse in 2008. The contagion from a collapse of this magnitude could potentially trigger a systemic banking collapse the likes of which the world has never seen. The EU would almost certainly disintegrate upon a collapse of this magnitude, as Deutsche Bank is the largest bank in Germany — which is essentially the financial heart and soul of the EU. 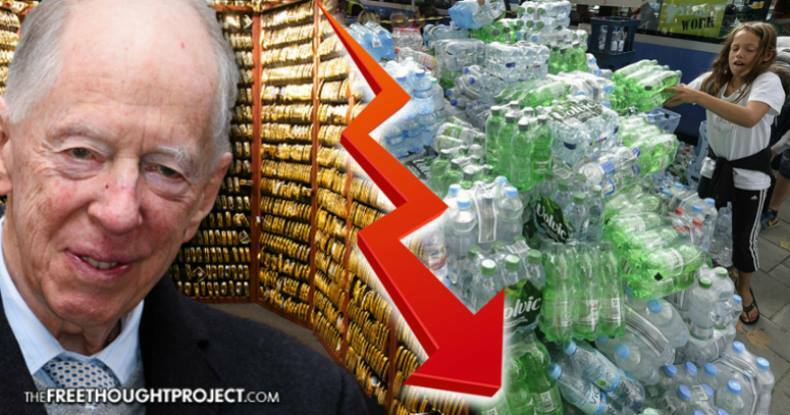 When Jacob Rothschild says that he is buying gold because the central banks are out of control, you begin to understand the scope and magnitude of what is transpiring, as his family has been in de facto control of the world’s central banks for centuries. Deutsche Bank shares have fallen sharply on the news that German Chancellor Angela Merkel won’t bail out the struggling bank, with shares falling by as much as six percent in early week trading, turning in their worst performance since 1992. Since just January, the bank’s shares have lost over 52 percent of their value. Merkel has also refused to provide state financial assistance to Deutsche Bank in its legal battle with the U.S. Department of Justice. The chancellor made her position clear during talks with Deutsche CEO John Cryan, according to Focus magazine. The German-based lender may be fined up to $14 billion over its mortgage-backed securities business before the 2008 global crisis. The German Chancellor also noted that Deutsche Bank will not be getting a bailout from the European Central Bank – the lender of last resort for European banks. 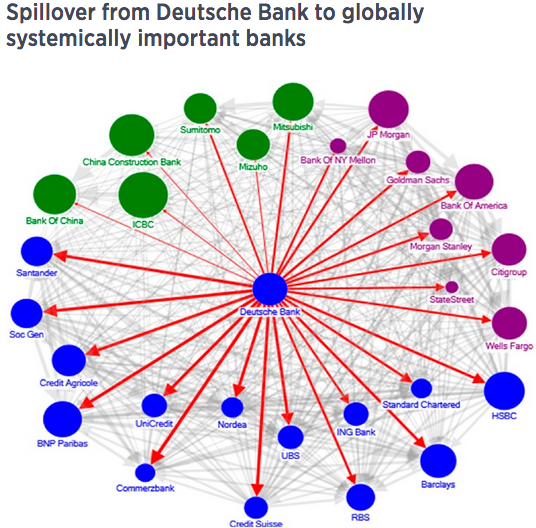 Revealing the truly dangerous threat the German megabank poses to the international banking system, a report from the International Monetary Fund in June implied that Deutsche Bank was a systemic risk to the global financial system. Many fear that in the wake of Merkel’s refusal to bail out Deutsche Bank, Germany may now be considering a bail-in instead? A bail-in is rescuing a financial institution on the brink of failure by making its creditors and depositors take a loss on their holdings. A bail-in is the opposite of a bail-out, which involves the rescue of a financial institution by external parties, typically governments using taxpayers money. Typically, bail-outs have been far more common than bail-ins, but in recent years after massive bail-outs some governments now require the investors and depositors in the bank to take a loss before taxpayers. Essentially, this entails the bank stealing deposited funds, with virtually no recourse for those individuals who have their savings stolen. It’s not at all beyond the realm of possibility, as it has happened before in very recent history. To keep the bank solvent, the Bank of Cyprus took almost 40 percent of depositor’s funds – leaving customers with essentially nothing they could do about having their money stolen. Assets were frozen and ATM machines were not refilled. Perhaps this explains why in mid-August Germans were told by their government to stockpile 10 days worth of water, and five days worth of food in case of a “national emergency” hitting the country, with the Czech Republic following suit and making a similar announcement within days of the German warning. Deutsche Bank’s unbelievably risky portfolio and its exposure to the derivative markets, which stands at over $40 trillion dollars, would undoubtedly cause exponentially more damage than the Lehman Brothers collapse did back in 2008, which precipitated the Great Recession of 2008. This risk of failure has now gotten so threatening that a number of funds that clear derivatives trades with Deutsche Bank AG have withdrawn excess cash and positions held at the lender, according to Bloomberg. While the vast majority of the bank’s more than 200 derivatives-clearing clients have made no changes, the hedge funds run on cash highlights serious concern. The paranoia of an imminent collapse spread to the US on Thursday, as 10 hedge funds that are Deutsche Bank clients have decided to withdraw cash and listed derivatives positions from the bank, according to a Bloomberg News report. Millennium Partners, Capula Investment Management and Rokos Capital Management are among about 10 hedge funds that have cut their exposure, said a person familiar with the situation who declined to be identified talking about confidential client matters. The hedge funds use Deutsche Bank to clear their listed derivatives transactions because they are not members of clearinghouses. Millennium, Capula and Rokos declined to comment when contacted by phone or e-mail. Highlighting the contagion banking effect, news that some hedge funds were pulling positions and excess collateral from Deutsche Bank caused shares of U.S. banks to quickly reverse early gains, according to Bloomberg. Just as Lehman Brothers disingenuously claimed they were financially solvent as the upcoming financial storm brewed in 2008, only to file for bankruptcy, Deutsche Bank has attempted to allay investor concerns by claiming that their financial fundamentals are sound. One would be wise to be very suspicious of any statements made by a failing banking institution. When the government warnings start, you can be assured that it’s already too late, as the availability of supplies in the case of emergency would be severely constrained after a warning due to the large number of people attempting to procure an extremely limited amount of supplies. Will Germany become the powder keg that implodes the global economy? Only time will tell, but all signs point to a very similar situation to 2008 — but without central banks having much recourse, as negative interest rates and quantitative easing were some of the last arrows in the quiver being used to prop up the global economy. What is certain is that an ounce of prevention, ahead of any potential collapse, is the most viable solution for those looking to safeguard themselves and their families. The key is to stock up on food, water and other necessities in advance of the actual crisis fully manifesting. A minimal amount of effort put into preparing early for the side effects of a major economic disaster could be the difference between surviving the crisis, or not, for your family. Please share this extremely important information to help others be prepared for this potentially dangerous crisis, the severity of which is largely being covered up by mainstream media!